This Danger Mouse-produced debut LP shows serious promise for the electro-pop duo. Any time there's a new band that features a member with a relatively famous relative, in this case the Lonely Island's Jorma Taccone, certain quesions about credibility are raised. While those questions aren't as nagging or as potentially harmful as the ones that plague artists like Sean Lennon, there's still a sense that something has to be immediately accounted for. Certain expectations are raised because of the idea that no one should be given a free pass in the entertainment industry due to immediate and apparent connections. Everyone seems to be out for the blood of the person that could be accused of capitalizing on those connections and Electric Guest have already weather their fare share of trepidation in expectation in this regard. While Mondo doesn't completely disspell the notion that there's a very real chance they exploited their connections to get to where they are right now, it's good enough on its own that it shouldn't warrant as much backlash as its gotten. Most of what I've been hearing surrounding this album has taken the backstory into account more than the actual music, which is a fairly artful take on the electro-pop genre. For starters, the enlistment of Danger Mouse was a smart move as he brings a certain element to the genre that allows it to breathe and feel slightly more organic in approach, which is always a bonus. For anyone familiar with his work as a producer and musician Mondo should immediately make them recall Broken Bells, his project with the Shins' James Mercer. Broken Bells was an interesting project for Danger Mouse because it interrupted a string of excellent production work where he always felt like an additional member, which is, once again, the case with Mondo. His presence is apparent in every track and elevates more than a few. Fortunately, he's a perfect fit for Electric Guest and his work is much more beneficial and complementary than distracting for the vast majority of the album. The lone exception comes in with the puzzling first track, "Holes", which feels like an extremely disjointed misstep that confuses inventiveness with bewilderment. Essentially, it comes off like a bastardization of dubstep given overtly pop trimmings and the majority of it ends up an incredibly jumbled mess and offers a very confusing start. Fortunately, this starts immediately remedied with lead single "This Head I Hold", an R&B-tinged rave-up that wouldn't have been out of place on one of those now iconic ipod ads. Its giddy nature recalls some of Danger Mouse's best work as a member of Gnarls Barkley. As the album progresses it, somewhat unsurprisingly, flits between sounding like Danger Mouse's two actual bands (Gnarls Barkley and Broken Bells) and acts as a comforting reminder of his talents while presenting a fairly decent case for Electric Guest as notable emerging artists. Mondo never really manages to separate itself from other bands though and in many portions feels like a predictable retread. In one of the records most surprising moments, "Troubleman", they do manage to break form and run free for a bit. While it still can't quite establish new ground and Taccone's vocals and vocal delivery sound eerily like James Mercer's, it does manage an impressive feat. During the course of its nearly nine-minute run-time it maintains the listener's interest. 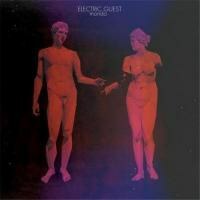 That alone proves that Electric Guest are not only capable of surprising but have a hold on some things most bands a few albums deep are still having trouble figuring out. "American Daydream", the ensuing track provides another highlight before the album ends on one of its most disappointing tracks, "Control". Ultimately, Mondo serves as much as an introduction to a promising new as it does a reminder of a major producing talent. That the two work so seamlessly together isn't much of a surprise, nor is the backlash that Mondo's been getting for the nepotism issue, considering that much of it is as radio-friendly as possible. What is surprising is how often the content's being overlooked when it's as consistent as it is. While it won't be showing up on any year-end lists, it'll be more than welcomed when it comes on the radio.